The Knebworth Festival 1979 consisted of two concerts performed by the English rock band Led Zeppelin and other artists at Knebworth House, Hertfordshire, England, in August 1979. The grounds of Knebworth House near the village of Knebworth had been a major venue for open air rock and pop concerts since 1974. In 1979, veteran promoter Freddy Bannister booked Led Zeppelin to play that year's concerts, which took place on 4 August and 11 August. The whole [Led Zeppelin touring] operation had become too big. Page's experience from the 1971 club tour ruled out any small dates. They had played the biggest indoor arena in the UK (Earls Court 1975) four years earlier. As Peter Grant saw it, they had to come back in the grandest style possible. Knebworth was the answer and after negotiations with promoter Freddie Bannister the 4 August date was scheduled with a second date on hold. The demand for tickets for the first date was enormous, leading to the second date being added. The band's fee for performing was reportedly the largest ever paid to one single act at that time. In the lead-up to the concerts, Led Zeppelin undertook extensive rehearsals at Bray Film studios in London, and attended the venue at Knebworth in order to inspect the site, complete a publicity photograph shoot and perform a soundcheck. In addition, they performed two low-key warm-up shows in late July at the Falkoner Theatre, Copenhagen, Denmark. 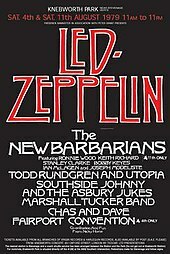 Also performing at the Knebworth concerts in 1979 were The New Barbarians, featuring Ronnie Wood and Keith Richards (The New Barbarians played only at the second concert on August 11); Todd Rundgren and Utopia; Southside Johnny; Marshall Tucker; Commander Cody; Chas & Dave and Fairport Convention. the largest stage ever constructed, 570 loo seats, 750 feet of urinals and the biggest rock band in the world. Led Zeppelin played their last ever concerts (in the UK) at Knebworth, and it was the end of an era for the Knebworth shows. Both concerts overran, noise complaints were received from 7 miles away. The rubbish team struggled to cope with clearing the arena between the shows. The police believed that 200,000 people had turned up each night, Sainsburys lost 150 trolleys and Tesco 75% of their stock, and Lord Cobbold [owner of Knebworth House] ended up in Court. For many in attendance it was their first ever concert experience. For many it would be the only time that they would get to see Zeppelin perform live. For that reason alone it holds a special affection in their live history. The first show in particular, with so much riding on it, was perhaps the most important they ever played. Similarly, music journalist Chris Welch has observed that the audiences "included a whole new generation who had never seen Led Zeppelin in their prime." The concerts received decidedly mixed reviews. Although the Record Mirror and Melody Maker provided generally positive reports, journalists from other major music publications such as New Musical Express, Sounds, Rolling Stone and The Sunday Times criticized Led Zeppelin's performances as being sluggish and rusty. With such a long layoff since their last performances in Britain, and in the wake of the punk rock revolution, Led Zeppelin were now considered to be obsolete in some quarters. Knebworth was useless. It was no good at all. It was no good because we weren't ready to do it, the whole thing was a management decision. It felt like I was cheating myself because I wasn't as relaxed as I could have been. There was so much expectation there and the least we could have done was to have been confident enough to kill. We maimed the beast for life, but we didn't kill it. It was good, but only because everybody made it good. There was that sense of event. I was racked with nerves. It was our first British gig in four years and we could have gone back to the Queen's Head pub. We talked about doing something like that. But instead we went back in such a flurry and a fluster to 210,000 people in a field and 180,000 more the next day [sic], surrounded by Keith and Ronnie and Todd Rundgren. Nobody's big enough to meet those expectations. But because there was some chemical charge in the air, it worked. It didn't work for us. We played too fast and we played too slow and it was like trying to land a plane with one engine. But it was fantastic for those who were there. Fans [at Knebworth] were still supporting the band, but there was definitely a feeling [Led Zeppelin's] days were numbered. Audience reaction at Knebworth had not been overwhelming and many seemed content to stand and stare, like mesmerised spectators at an alien ritual, a far cry from the hysteria of earlier shows. Robert Plant seemed perplexed at the silence between songs, when you could practically hear a pin drop in that vast, cold field. It wasn't until he led the way into "Stairway to Heaven" and "Trampled Underfoot" that roars of appreciation began to echo around Knebworth. The two concerts were professionally recorded on the Rolling Stones Mobile Studio (engineered by George Chkiantz) and also filmed, with live images beamed directly onto a giant screen behind the stage. The filming was done by the TV International company under the direction of Chris Bodger. There was a plan for the footage to be used on a television special (this is one of the reasons the band members wore the same clothes on both nights) but this idea was never realised. Only short clips of some of the songs were used by Atlantic Records for promotional purposes. For many years, bootleg copies of this audio and video material circulated amongst fans. The first audience recorded bootlegs became available in early 1980. However, aside from the promotional snippets, Led Zeppelin never officially released any of the recordings until 2003, when parts of the footage were digitally remastered and included on the Led Zeppelin DVD. Two songs from the band's eighth and most recent studio album, In Through the Out Door were played for the first time on stage, namely "Hot Dog" and "In the Evening". The album was intended to be released prior to the band's concerts, but production delays pushed its release date to shortly after the event. Plant jokingly referred to the delays at times during the performance on 4 August. All tracks written by Jimmy Page and Robert Plant, except where noted. Following the event, a dispute arose between Grant and Bannister about the attendance figures at the event. A query by Grant over ticket sales for the concerts resulted in him sending aerial pictures of the crowd to a monitoring laboratory in Nassau, New York, in order to establish the extent of the attendance. He claimed that some 218,000 people were at the first concert and 187,000 at the second. However, the license was for only 100,000 and Bannister claimed that only 104,000 had attended in the first week. For the second show, Grant brought in his own staff to man turnstiles and count tickets. This disagreement eventually forced Bannister's concert promotion company into liquidation, which allegedly left unpaid bills of £50,000 for the police and £2,000 to the local borough council. ^ "Led Zeppelin - Official Website Knebworth Festival - August 4, 1979". Led Zeppelin - Official Website. Archived from the original on 2008-09-13. Retrieved 2008-07-27. ^ "Led Zeppelin - Official Website Knebworth Festival - August 11, 1979". Led Zeppelin - Official Website. Archived from the original on 2008-09-15. Retrieved 2008-07-27. ^ a b c d e f g h i j k l Dave Lewis (2003), Led Zeppelin: Celebration II: The 'Tight But Loose' Files, London: Omnibus Press. ISBN 1-84449-056-4, pp. 54-63. ^ a b c d Chris Welch (1994) Led Zeppelin, London: Orion Books. ISBN 1-85797-930-3, pp. 83, 87-90. ^ Rock at Knebworth House: The 70s Archived 2006-01-03 at the Wayback Machine. ^ Dave Lewis and Simon Pallett, (1997) Led Zeppelin: The Concert File, London: Omnibus Press, p. 133. ^ Nigel Williamson, "Good Times...Bad Times", Uncut, May 2005, p. 61. ^ Shawn Perry, "Bathing At Knebworth: The Festivals Of The 70s Archived 2010-11-29 at the Wayback Machine", vintagerock.com. Lewis, Dave and Pallett, Simon (1997) Led Zeppelin: The Concert File, London: Omnibus Press. ISBN 0-7119-5307-4. This page was last edited on 8 April 2019, at 20:24 (UTC).